I am slightly obsessed with invitations as you may have guessed....I can't help it....they really help to set the tone of the event. I have been involved with creating many in the past for the events I worked on so I really want to make sure the invites for our wedding are just perfect! I know it's a little early, but I've started our initial design and really love it! It's unique, but simple...now to find the perfect printer...this seems to be the hard part! Although I have been in communication with several that are promising and are willing to print outside designs. Save the Dates will be going out shortly...although if you're reading this, you probably already have the date saved ...so it's for everyone else! 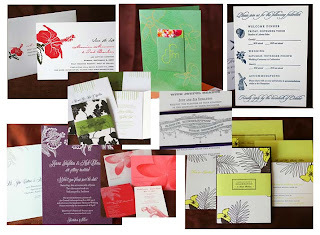 Check out the invite suites from CeCi NY a preeminent NY invitation designer.